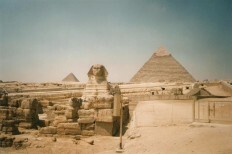 I flew to İstanbul and bought a cheap air ticket on to Cairo from there. I traveled around Egypt for about three weeks: Cairo and the vicinity, Luxor and the Valley of the Kings, Aswan and Abu Simbel, and then the Sinai peninsula where I climbed Mount Sinai and hung out in Dahab for a while. I then returned to İstanbul overland via Jordan and Syria. These pages have pictures of the Egyptian part of the trip. 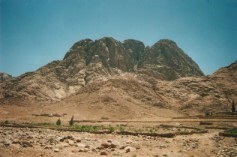 Mount Sinai as seen from a nearby village. The Sphinx and the Pyramids on the Giza Plateau just outside Cairo.